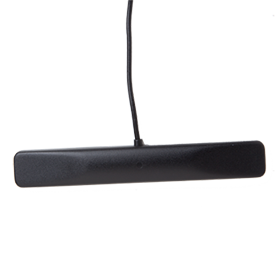 HDP Series horizontal antennas stick to glass, plastic and other non-conductive surfaces. They feature multiple frequency bands at 824 – 960MHz, 1.71 – 1.99GHz and 2.40 – 2.48GHz. Each antenna is attached to a 9.8-foot (3m) cable with an SMA, TNC or FCC Part 15 compliant RP-SMA connector on the other end.